– The handle and lid are coated for safety and easy handling. – Anodized surface can withstand scratches and abrasions. – Convenient folding handle locks into place when boiling. 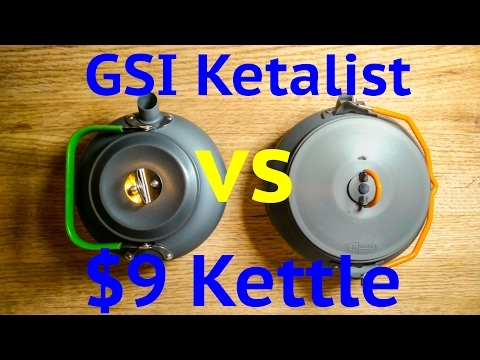 – Traditional kettle design, easy to pour. – Suitable for campers and backpackers. – Lightweight, easy to handle, and fast heating, the teakettle is a must for tea and coffee drinkers. High quality high temperature resistant anodised aluminum pot body, solid and ultra light. High hardness of anodic oxidation treatment for both inside and outside. Corrosion resistant. Scratch resistant and easy to clean. Folding handle for easy and comfortable gripping. Aluminum conducts heat better and more evenly. Lid hook and handle can be put up and down. Safe for most outdoor furnace as well as gas stove. Suitable for indoor and outdoor. Ideal for camping, hiking, picnic, fishing and other outdoor activities. A mesh bag is giving for easy carry and storeage.